Spiders belong to the arachnid family and have a staggering 30,000 “known” species. Of the thousands, there are several types of spiders in New York. Spiders have diverse habitats, owing to the variety in their species. Only a few species nest inside homes, buildings, and other structures. They don’t have sharp teeth with which they can butcher their prey. Instead, they have fangs that inject potent venom to paralyze the prey. Despite the diversity in their species, spiders undergo the same stages in their life cycle ― egg, spiderling, and adult. A spider’s body is divided into two distinct parts ― cephalothorax and abdomen. In comparison, an insect’s body is comprised of three sections ― head, thorax, and abdomen. Also, spiders have 8 legs, whereas insects have only 6. The smallest known spider is just the size of a pencil’s tip, and the largest one is more than 9 inches long. Spiders belong to the arachnid family and have a staggering 30,000 “known” species. Some scientists have surmised that more than 70,000 species are still undiscovered. Spiders are known for their silk-weaving ability, but you’ll be surprised to know that most spiders lack this ability. Silken threads are used to trap and entangle prey. Most species don’t require these silk webs because they are large enough to swallow tadpoles, fish, and mice alive. Spiders have interesting dietary behaviors. They don’t have sharp teeth with which they can butcher their prey. Instead, they have fangs that inject potent venom to paralyze the prey. In some instances, the venom is strong enough to kill the prey instantly. After paralyzing or killing the victim, the spider secretes digestive enzymes to dissolve its body tissues for ingestion. 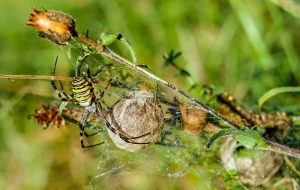 Spiders form a shield of silk around their eggs to protect them. Newly hatched eggs sometimes turn out to be cannibals. After a short molting process, they attain their maximum size and more or less resemble adults. Spiders can easily withstand harsh environmental conditions, such as an intense cold― even young, immature spiders. Some species have this unique ability to weave a silk thread from their rear ends, which functions as a parachute and enables them to be carried away to new locations by the wind. Spiders have diverse habitats, owing to the variety in their species. 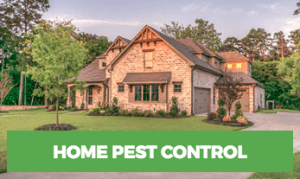 Only a few species nest inside homes, buildings, and other structures. They almost always invade homes in large numbers. 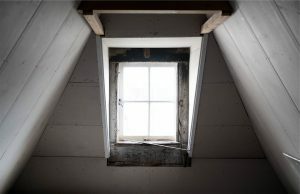 They prefer dark, concealed parts of a house, such as an attic or a basement. If you spot their webs, don’t freak out, because you only see them when they’re no longer occupied. Besides, deadly species of spiders don’t weave their webs out in the open, especially near windows or on walls. Most spiders inhabit outdoor environments, such as barns, forests, marshes, wetlands, and even deserts. Despite the diversity in their species, spiders undergo the same stages in their life cycle ― egg, spiderling, and adult. Males approach the female carefully so that they are not mistaken for prey. After mating, many male spiders lose their lives. The female is very much capable of taking care of the eggs all on her own. The female spider lays its eggs inside a cocoon of strong silk, which she weaves herself, to protect her developing offspring. This silk cocoon is also the place where these eggs are fertilized one by one. The eggs hatch in around a week. Most female spiders are overly-protective of their offspring, and take strict measures to guard them against predators. Premature spiders, called spiderlings, look more or less like their parents but are much smaller in size. Spiderlings leave the cocoons soon after hatching from the egg and travel short distances by a behavior called ballooning. They clamber on onto a high object and let their abdomens develop. The silk released from their spinnerets helps them to get carried away by the wind. They undergo five to ten molts to shed their delicate exoskeleton so that a new hardened one can take its place. As soon as a spiderling reaches adulthood, it starts searching for a mate to restart its lifecycle all over again. Females are blessed with longer lives than males. Tarantulas have an incredibly long lifespan ― some surviving for more than 20 years. Most species of spiders that invade homes can spin webs and is an important way to spot spider infestations. 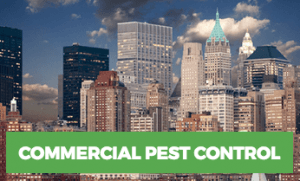 • Look for spider webs in isolated, dark, and inaccessible parts of your home. • The hiding spot of some species of spiders is a burrow rather than a web. Thoroughly check your basements, attics, and sheds for crevices or entry points. How harmful is a spider bite? The infamous black widow made a name for itself by inflicting venomous bites. But are spider bites fatal? No! Scientists say that while spider bites may cause acute symptoms, such as high fever, nausea, intense headaches, they are highly unlikely to cause fatalities. People who have a fragile immune system are at a higher risk of developing complications that may lead to death. Spiders do no transmit any serious diseases. 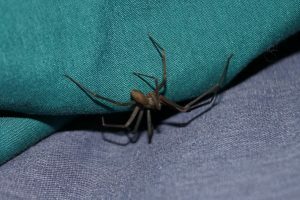 To avoid complications, it is advised to seek medical help at the earliest following a spider bite. The easiest method of preventing a spider infestation is cleaning your home thoroughly. Vacuum, sweep or broom webs, and clean dust from the ceilings really carefully. Spider love damp and dark environments, so make sure that you don’t leave out your attics and basements in the cleaning process. Also, remove excessive clutter in your home to remove hiding spots for spiders. Unkempt lawns are a big No! Make sure you cut down mulches, weeds, and mow the grass regularly. Sealing cracks and crevices with inorganic crack isn’t an effective preventive measure, but it still helps. If all else, fails, you can always rely on cats to get the job done for you. Cats are excellent spiderhunters and will make your home spider-free in no time at all.